It’s the height of summer, your home is on the market, and your dog sheds enough to make an entire flock of sheep nervous about job security. You REALLY need a temporary home for Spot while prospective homebuyers are picking over your house. What to do? Rover Stay Over has become a leader for dog owners in Whatcom County and beyond who want the best available care for their beloved pups. If you’re looking for long-term boarding for your dog while you’re away on vacation, having surgery or putting your house on the market, you can’t do better than Rover. We care deeply about cleanliness. Doggie comfort is important to us here at Rover Stay Over. Not only have we purchased elevated dog beds for all of our canine guests, but we wash them every single day. Twice. Elevated beds are a clean, pet-friendly alternative to traditional, on-the-floor dog beds. With an elevated bed, air can circulate underneath your furry friend, keeping him or her at a comfortable, even temperature. Spilled water and other accidents stay harmlessly away, helping ensure your pup stays dry and comfortable. Oh, and speaking of cleanliness: We also wash all of our dog kennels every single day (twice, naturally). We care deeply about dog health. Pups who stay with us at Rover Stay Over are regularly exercised. 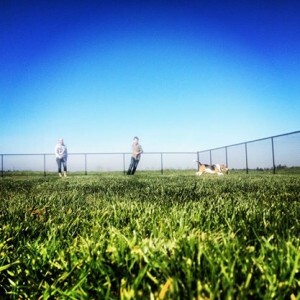 We have six outdoor play areas where dogs can play individually or with specially assigned play buddies. Our 5-acre dog kennel near Bellingham is a doggie heaven. You can also book country walks for your pup; these walks often come with the added value of a little extra leash training. Also, because we want your best friends to be happy and healthy when they stay at Rover, we never charge for the administration of a dog’s medication at our kennel. When you need to be away from home — or when you need your dog to be away — for an extended period, consider using Rover Stay Over as your pup’s second home. At our clean, modern dog-boarding facility, we always do everything we can to ensure your four-legged friend has a great time away and is returned home happy, healthy and dog tired!